This Week's Featured Advertisement: One Gently Used BrailleSense Plus 32 Cell Notetaker With Braille Keyboard for $1,995.00 USD!!! Flying Blind, LLC is pleased to offer one lucky customer the opportunity to get their hands on One Gently Used BrailleSense Plus 32 Cell Notetaker with Braille Keyboard for the fantastic price of $1,995.00 USD. This rugged, versatile organizer offers state-of-the-art connectivity coupled with industry-standard know-how in a sleek design that has truly limitless capabilities. 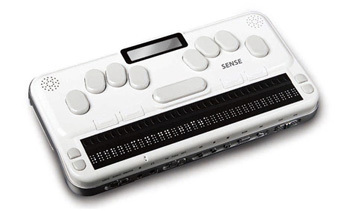 The BrailleSense line of products is establishing itself as the preferred notetaker of choice for individuals wishing to benefit from and interact with mainstream applications and hardware peripherals. Take advantage of this incredible bargain which saves you several thousand dollars off the list price of other notetaking solutions. This cost also includes shipping within the 48 Continental United States. This is a single unit that will be sold on a first come, first serve, basis. To be the first to secure this unit, please use the Buy Now link included below. For additional questions, or to purchase this product offline, email featured@flying-blind.com or call +1 (216) 381-8107 today. 2) David Bales has written some guides for using Windows 8.1. They can be found in the Windows 8.1 section of this page, which contains lots of other useful guides. B) What is the Malicious Software Removal Tool and Do I Need It? C) Should I Store My Batteries in the Fridge?